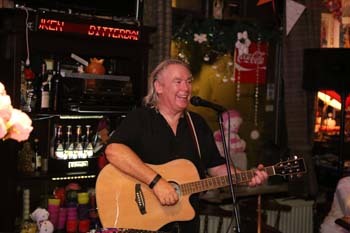 After a great time in Scotland, we headed to the Netherlands for some time with friends and family ... and also a gig in my favourite Dutch pub - the Cafe Back in Town. The owners of the Back in Town, Toon & Gon, beacame good friends when we lived in Ugchelen - Gon visited us in Portland a few years ago - and even roadied for me at the Portland Highland games. Back in Town nights were always a great laugh - I played there often in Keltic Fire days with my pal Feargal. The 4th December was a great night reminding us of those old times. 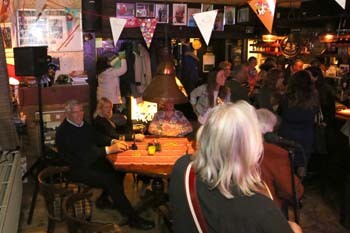 Lots of people came along and we all had a ball. 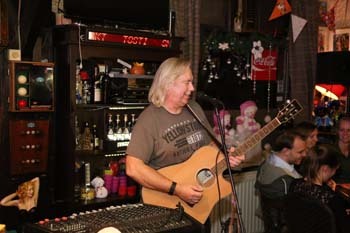 I got to sing my two Dutch songs, play my Dutch guitar and use my old Bose pro PA system - great! After the Netherlands we headed back to the USA, picked up our 5th wheel and truck in San Francisco and set off on the road again. We took a week to drive to San Diego stopping off here and there on the way down. It was nice to get into T-shirt and shorts again after a cold 5 weeks in Europe. 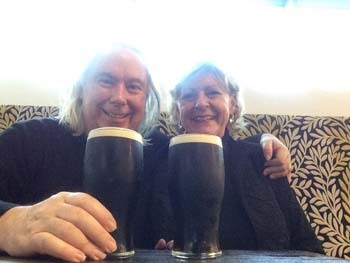 We've been a week in lovely San Diego, a few miles from the Mexican border, and Michelle (my tour manager) has lined up a gig in a great Irish pub in the San Diego Gaslamp area - the Field. We went there yesterday to check it out , meet my contact and hand in posters. Very nice place, great atmosphere and really Irish. I'm looking forward to playing there. I mentioned last time that I planned to write songs over the Winter - well since we've been in San Diego I already have a few songs written (hooray!!!) . Written means - words written, discarded, re-written, edited, scrapped, done over, music written (same process as the words) , rough recording done AND - most importantly - with Dorothy seal of approval! It's going quite well although the time just whizzes by. I'm using the ideas I had in Scotland and amazingly, they are flowing out without much problem, the problem is trying to make them not be crap. There was one, I'd written the words and I had this tune in my head that went really well with it - so I sang it to Dorothy - she laughed "that's Spancil Hill!" ooops! I hadn't even recognised it . I left it there for the rest of the day and just before bedtime - a new tune just showed up in my head, I played it and recorded it right away! It's a new experience for me. I'm really enjoying it. My first Hawaii date was confirmed a couple of days ago - I'll be playing in Kelley O'Neils in Honolulu on Wednesday January 26th 5pm to 8pm. We arrive in Honolulu the day before (Jan 25th - Burns night) and we're attending the Caledonian Society of Hawaii's Burns Supper on the Saturday with friends we met at the Galway Bay Irish festival at Ocean Shores - that'll be good! 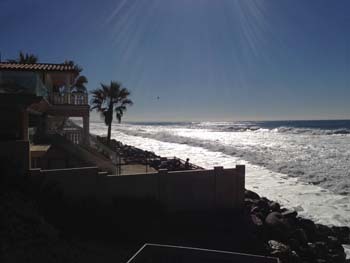 After the busy time we had in Scotland and Netherlands, we'll just be staying in San Diego over Christmas and New Year, with the odd jaunt around and about. It'll be our 1st Christmas with just the two of us - but Skype, Facetime, email and Facebook will help bridge the distance to family and friends for us. Have a Merry Christmas and Great New Year when they come!! !